Google have made, what may seem like a rather bold claim; the economic downturn is almost over. Eric Schmidt, Google's chief executive, revealed that "the worst of the recession is behind us" and that Google was moving into a period of "seriously looking at acquisitions" again. Schmidt revealed all in a recent interview with Nikkei, saying that Google is eager to move back into the search for venture-stage firms that show strong potential for growth, which it could acquire. Following on, Schmidt indicated that the main thrust of this search would be to make a number of strategic acquisitions expanding its cloud computing operation. 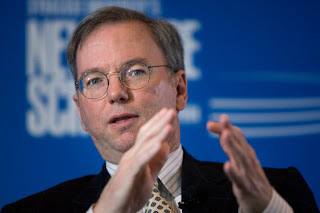 Schmidy commented on Google's belief that the "personal computer era" will give way to the "age of cloud computing" within the coming ten to 15 years. This is sure to see Google continue to expand both it's on-system software options and its web apps such as its Google Docs and Gmail.